"Con man" and "Scam" redirect here. For other uses, see Con Man (disambiguation), Confidence man (disambiguation), and Scam (disambiguation). "Confidence game" redirects here. For the 2016 film, see Confidence Game (film). "Ripoff artist" redirects here. For counterfeits, see knockoffs. A confidence trick (synonyms include con, confidence game, confidence scheme, ripoff, scam, and stratagem) is an attempt to defraud a person or group after first gaining their confidence, used in the classical sense of trust. Confidence tricks exploit characteristics of the human psyche, such as credulity, naïveté, compassion, vanity, irresponsibility, and greed. Researchers Lindsey Huang and Barak Orbach defined the scheme as "a distinctive species of fraudulent conduct ... intending to further voluntary exchanges that are not mutually beneficial", as they "benefit con operators ('con men') at the expense of their victims (the 'marks')". The perpetrator of a confidence trick (or "con trick") is often referred to as a confidence (or "con") man, con-artist, or a "grifter". Samuel Thompson (1821–1856) was the original "confidence man". Thompson was a clumsy swindler who asked his victims to express confidence in him by giving him money or their watch rather than gaining their confidence in a more nuanced way. A few people trusted Thompson with their money and watches. Thompson was arrested in July 1849. Reporting about this arrest, Dr. James Houston, a reporter of the New York Herald, publicized Thompson by naming him the "Confidence Man". Although Thompson was an unsuccessful scammer, he gained reputation as a genius operator mostly because Houston's satirical writing wasn't understood as such. The National Police Gazette coined the term "confidence game" a few weeks after Houston first used the name "confidence man". A confidence trick is also known as a con game, a con, a scam, a grift, a hustle, a bunko (or bunco), a swindle, a flimflam, a gaffle, or a bamboozle. The intended victims are known as marks, suckers, stooges, mugus, rubes, or gulls (from the word gullible). When accomplices are employed, they are known as shills. A short con or small con is a fast swindle which takes just minutes. It typically aims to rob the victim of everything in his wallet. A long con or big con (also, chiefly British English: long game) is a scam that unfolds over several days or weeks and involves a team of swindlers, as well as props, sets, extras, costumes, and scripted lines. It aims to rob the victim of huge sums of money or valuable things, often by getting him or her to empty out banking accounts and borrow from family members. 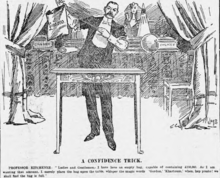 In Confessions of a Confidence Man, Edward H. Smith lists the "six definite steps or stages of growth" of a confidence game. He notes that some steps may be omitted. Preparations are made in advance of the game, including the hiring of any assistants required. The victim is given an opportunity to profit from a scheme. The victim's greed is encouraged, such that their rational judgment of the situation might be impaired. The victim receives a small payout as a demonstration of the scheme's effectiveness. This may be a real amount of money, or faked in some way. In a gambling con, the victim is allowed to win several small bets. In a stock market con, the victim is given fake dividends. A sudden crisis or change of events forces the victim to act immediately. This is the point at which the con succeeds or fails. A conspirator (in on the con, but assumes the role of an interested bystander) puts an amount of money into the same scheme as the victim, to add an appearance of legitimacy to the scheme. This can reassure the victim, and give the con man greater control when the deal has been completed. In addition, some games require a "corroboration" step, particularly those involving a "rare item". This usually includes the use of an accomplice who plays the part of an uninvolved (initially skeptical) third party, who later confirms the claims made by the con man. Cons succeed for inducing judgment errors—chiefly, errors arising from imperfect information and cognitive biases. In popular culture and among professional con men, the human vulnerabilities that cons exploit are depicted as ‘dishonesty,’ ‘greed,’ and ‘gullibility’ of the marks. Dishonesty, often represented by the expression ‘you can’t cheat an honest man,’ refers to the willingness of marks to participate in unlawful acts, such as rigged gambling and embezzlement. Greed, the desire to ‘get something for nothing,’ is a shorthand expression of marks’ beliefs that too-good-to-be-true gains are realistic. Gullibility reflects beliefs that marks are ‘suckers’ and ‘fools’ for entering into costly voluntary exchanges. Judicial opinions occasionally echo these sentiments. Accomplices, also known as shills, help manipulate the mark into accepting the perpetrator's plan. In a traditional confidence trick, the mark is led to believe that he will be able to win money or some other prize by doing some task. The accomplices may pretend to be strangers who have benefited from performing the task in the past. ^ a b c Braucher & Orbach. ^ David Maurer, The Big Con Archived 2016-06-24 at the Wayback Machine, Chapter Eight: "Short-Con Games"
^ Yagoda, Ben (June 5, 2012). "The long game". Not One-off Britishisms. Archived from the original on July 7, 2014. This language blog, while not a reliable etymological source, provides statistically gathered usage data that demonstrates neutral as well as critical usage, and that it is of British origin, only recently making notable inroads into American English. ^ a b Edward H. Smith, Confessions of a Confidence Man: A Handbook for Suckers Archived 2016-04-24 at the Wayback Machine, pp. 35–37. Bell, J. Bowyer; Whaley, Barton (1982). Cheating and Deception (reprint 1991). New Brunswick & London: Transaction Publishers. ISBN 978-0887388682. Blundell, Nigel (1984) . The World's Greatest Crooks and Conmen and other mischievous malefactors. London: Octopus Books. ISBN 978-0706421446. Dillon, Eamon (2008) . The Fraudsters: Sharks and Charlatans – How Con Artists Make Their Money. Merlin Publishing. ISBN 978-1903582824. Ford, Charles V. (1999) . Lies! Lies!! Lies!!! : The Psychology of Deceit. American Psychiatric Publishing, Inc. ISBN 978-0880489973. Henderson, Les (2000). Crimes of Persuasion: Schemes, scams, frauds. Coyote Ridge Publishing. ISBN 978-0968713303. Kaminski, Marek M. (2004). Games Prisoners Play. Princeton: Princeton University Press. ISBN 978-0691117218. Konnikova, Maria (2016). The Confidence Game: Why We Fall for It...Every Time. ISBN 978-0525427414. Maurer, David W. (1999) . The Big Con: The Story of the Confidence Man and the Confidence Game (reprinted). New York: Bobbs Merrill / Anchor Books. ISBN 978-0385495387. Maurer, David W. (1974). The American Confidence Man. Springfield: Charles C. Thomas, Publisher. ISBN 978-0398029746. Reading, Amy (2012). The Mark Inside: A Perfect Swindle, a Cunning Revenge, and a Small History of the Big Con. New York: Knopf. ISBN 978-0307473592. Smith, Jeff (2009). Soapy Smith: The Life and Death of a Scoundrel. Juneau: Klondike Research. ISBN 978-0981974309. Sutherland, Edwin Hardin (1937). The Professional Thief (reprint 1989). Chicago: University of Chicago Press. ISBN 978-0226780511. Weil, J.R. "Yellow Kid" (1948) . Con Man: A Master Swindler's Own Story. New York: Broadway Books. ISBN 978-0767917377. Zhang, Yingyu (2017). The Book of Swindles: Selections from a Late Ming Collection. New York: Columbia University Press. ISBN 978-0231178631. Wikivoyage has a travel guide for Common scams. "Arrest of the Confidence Man". New York Herald. 1849. "Book of Swindles". ChinaFile.com. Confidence tricks in China. "The Blonger Bros". blongerbros.com. Lou Blonger was the head of a large gang of confidence men running the Big Con in 1910s Denver. "To Catch a Con Man". Dateline NBC investigation.